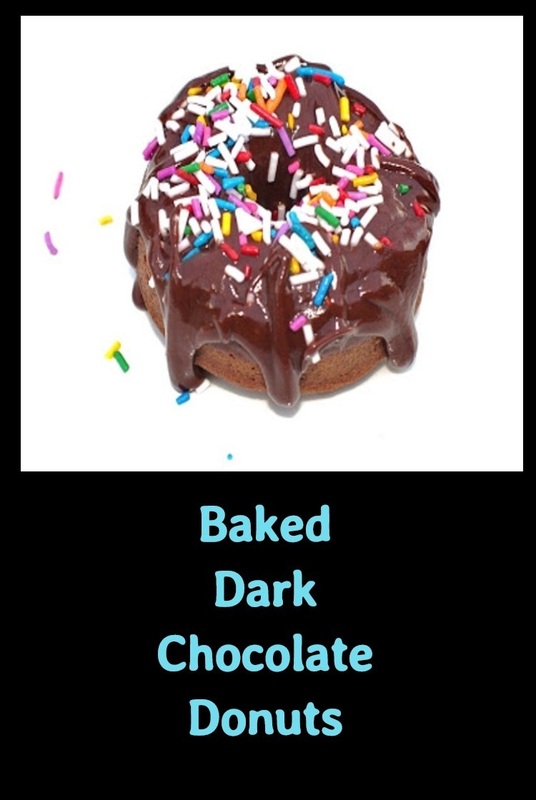 If you are chocolate lover, this is a decadent chocolate lovers dream baked dark chocolate donut. It has ganache dripping all over it with colored sprinkles to delight anyone from a childhoods favorite to a young at hearts fantasy. This is a chocolate lovers dark chocolate treat that will be enjoyed time and time again and the best part it, they're baked! The easiest donuts I ever made! These are so easy to make and everyone loved how moist they were. If you love chocolate donuts, this will be your new favorite recipe and they'er baked! 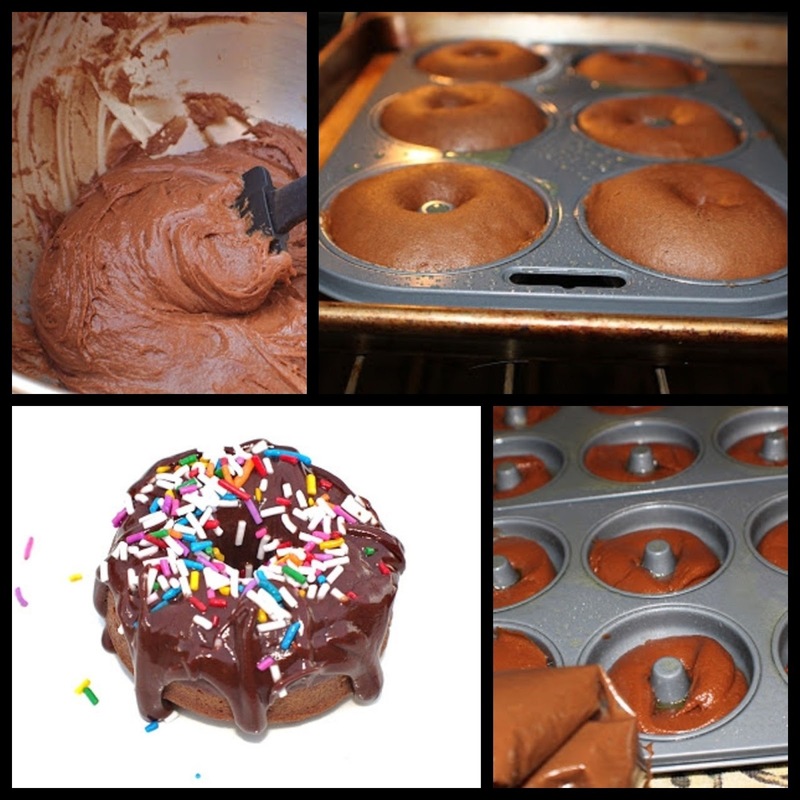 If you are looking to bake the perfect chocolate donut recipe, you just found it. These are moist and rich in dark fudgy chocolate decadence. I never was a huge chocolate fan but these won everyone's heart including mine. I love the ganache and fun sprinkles on top. All the kids and functions I bring these too get rave reviews. You will need a donut pan but it's well worth the investment. You can find them at any baking shop or use my affiliate link at the top of the page under shop with me. Celebrate Everyday with Baked Chocolate Donuts! When you think of decadent donuts that are over the top yummy, this will be your go to recipe like mine. These Baked Dark Chocolate Donuts are screaming chocolate fudge! I just love bringing these to family outings, everyone thinks they were from a famous bakery. Then when I tell them I made them and they're baked not fried it's a bonus indeed! I love chocolate donuts and tell myself they are a healthy breakfast, baked not fried and has eggs in the batter, just joking of course. I really believe these are the best baked donuts on the planet. I have made them time and time again and very glad I have a donut pan. Everyone including myself was very impressed. Even thought I am an avid lover of vanilla cakes and donuts these are simply divine. The last function I brought these to, was for a beautiful chocolate pot luck party. There was a actual competition for the most decadent dessert made with with all chocolate. Guess what won? Yes indeed these babies won the prize. I was excited and not really surprised since they were the hit of the party. I did have to admit though, the dark chocolate dipped apples were pretty impressive also. She won second place. We both were over the moon over it. The both of us got gift certificates for a great local restaurant, just in case you were wondering. Combine flour, cocoa powder, baking powder, baking soda and salt; set aside. Combine egg, egg yolk, vanilla and sugar and beat until light and fluffy. Add in milk and beat to combine. Add in beer and beat to combine. In a glass bowl melt butter and chocolate in the microwave about one minute stirring until melted. Use a sturdy spoon or spatula to fold in chocolate mixture and blend evenly. Prepare donut pans by lightly spraying with cooking oil. Transfer donut batter into a gallon size zip lock bag and snip the end. Pipe once around each well with enough to fill the well 1/4 of the way up, then if bumpy smooth the bumps with your finger dipped in water to make a smooth batter. Bake till tooth pick comes out clean check after 7 minutes. Combine butter and chocolate in a bowl over simmering water. Heat to melt and add powdered sugar ½ cup at a time, alternating with a tablespoon of water. Dip the top of the donuts in this wonderful ganache style frosting and place on parchment paper or wax paper to dry. Use sprinkles, chocolate curls, toasted coconut, mini chocolate chips for garnish. Enjoy! Not the one you wanted? Try these other delicious donuts recipes! I don't have a donut pan ! I haven't seen one where I live in Australia so I'm going to have to order one online. These donuts look too good to pass up. This recipe calls for a Homer Simpson quote "Donuts. Is there anything they can't do?" Wow - these look incredible! My husband absolutely loves donuts. I am going to have to break down and buy the pan! I am subscribed to your blog and viewed and commented from the subscription email...I'm headed to food buzz now to buzz this one! Cool.... a donut pan... I never saw such a thing! Super great! You know my Dad would LOVE these!!! He's a bigger chocoholic than I am. Beautiful photos Claudia, as always making me very hungry! What a cool pan!!! I wonder what else you can make in it? Lovely donuts!! So okay, you bake them in a modified muffin pan. They look like doughnuts for sure, but without that precious deep-fryer fat - Do they taste like doughnuts? The photos make it look like they do. Since they are "baked", they are more healthy, which means we can more of them, right? Have to make sure I forward this recipe to Lora. She also has a donut pan. This is incredibly decadent and over the top delicious. Yummm!!! Hey, I just looked at the side of this blog and there was a post on sausage and peppers. What a coincidence, I just made that for me and the tipster today for lunch. I said to myself, let me see this recipe. Surprise, your recipe was exactly how I made it. I fried onion too and served it on french bread (kinda like a baguette). You're pretty cool. Do they still have Utica club beer up there? Probably not. Dark chocolate, dark beer and baked. Wow, Claudia - I need to do this when I have a life. OMG how delectable Claudia! I have to get me one of those pans - my family would love these! Great job on these. I am now craving donuts! Thank you, Claudia, for this recipe. I'm a bit concerned by how much donuts some people in my house consume. This will be a good project now that it's school holidays. How I would love to have just one of these gems for breakfast! A nice chocolatey way to start the day. Baked donuts are so much healthier and easier than fried. Great post and tempting picture-Yum! I am not sure words do this justice, they look fabulous!! And beer in the donuts? I need a donut pan pronto! How I now regret starting a diet today! Looks wonderful. Wow, I've never made homemade donuts, but these are inspiring! I have just bookmarked this, Claudia, and when it cools down enough for me to try it, I will give you full credit. I have yet to find a good baked donut recipe. Baked donuts with ganacha...they look heavenly! Those look awesome,I really want a donut right now!Thank you very much. Ok that's it... I HAVE to get one of those donut pans... I've been holding off but WOW! Those are calling my name so loud.. Yum! I am so regret for not buying that baking tray earlier. Isn't it look great! What a great excuse to buy a donut pan. Oh Claudia, you could just POUR that gorgeous chocolate ganache icing down my throat! I can never turn down a chocolate donut and yours, well, look superb with that icing! These are fantastic! Wow look at that luscious chocolate glaze...delicious! I'd buy a pan just to make this recipe. Pinned it for when I have said pan. :) Looks scrumpdillicious! what could you replace the beer with? I need to get me a donut pan, these look amazing! I love how decadent they are! Obviously I need to pull out my donut pan and bake a batch of these. I haven't baked donuts in a long time! Loving the chocolate ganache and sprinkles on top! Baked donuts are the best! So easy! These look delicious! Oh my goodness, I would have never thought to use ganache on a donut recipe! Brilliant! My husband is a big fan of chocolate doughnuts and I like that these are baked instead of fried. This would be a lovely treat for Father's Day. I want to wake up to one of those! I'm a sucker for donuts... and chocolate... and sprinkles! Baked donuts are THE BEST!! So much better than fired. This is a great treat and would pair nice with my afternoon latte.